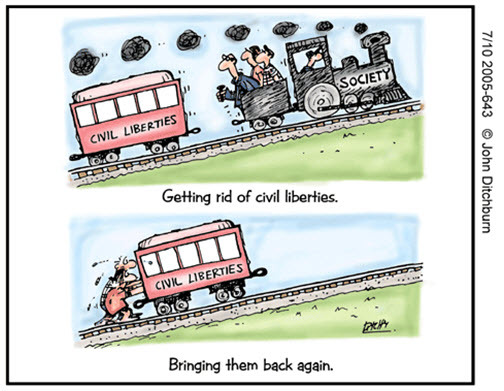 This is the fifth annual report of Civil Liberties Australia Inc, registered association no. A04043, trading as and known as Civil Liberties Australia, or CLA. This annual report report covers the period from 1 January 2008 to 31 December 2008. Directors remain in office until the 2009 AGM (which is an electronic annual general meeting), when they are eligible to stand for office again. No office bearer received any remuneration from CLA, or had any interest in any financial activities of CLA, other than in the proper, normal course of reimbursement of expenditure outlaid for the good governance, administration and promotion of CLA. In 2008, CLA made a range of submissions, which easily exceeded business plan targets, across many issues, reported on in dot point form below. However, there was one outstanding example of how such submissions can bear fruit…even if in surprising directions! ignoring what happens to people we extradite to other countries. CLA’s submissions to the Joint Standing Committee on Treaties (JSCOT) and the appearance of two of its Directors as witnesses were directly responsible for both these positive changes recommended by JSCOT to Australian Government policy. The most outstanding result would be preventing a reoccurrence of the ‘Bali 9’ situation. That is where the Australian Federal Police ‘shopped’ nine Australians – three of whom remain on death row at the end of 2008 – to Indonesian authorities for drug trafficking when the AFP could have waited, and arrested and charged the nine in Australia. 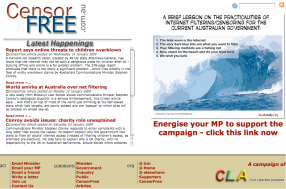 CLA, along with all other Australian civil liberties and human rights groups, had been campaigning for just such instructions since immediately after the arrest of the Bali 9 in April 2005. CLA’s submission to JSCOT in May 2008 was officially on a treaty with the United Arab Emirates: however, the UAE treaty allowed CLA to raise associated issues. The CLA paper and evidence to the hearing tipped the balance towards a new, human rights-oriented approach to Bali 9 intelligence-exchange considerations, helped by JSCOT having a new chair, Kelvin Thomson (Lab, Wills, Vic – pictured), and a new human rights-friendly approach, much to the credit of new MHR, Melissa Parke (Lab, Fremantle, WA), and several other 2008 committee members. In the second major victory for common sense and meeting the nation’s moral obligations, JSCOT also adopted CLA’s proposals to check on people Australia extradites. This change in policy would guarantee we monitor the status, treatment and health of people we send to other countries. Currently, Australia acts like the three monkeys, extraditing people but undertaking no formal checking, follow-up or monitoring of what happens to them. CLA alone pointed out this glaring anomaly, of which the committee was unaware because the committee had never received a report on how any one of the 30-plus similar treaties it had approved were operating in practice. that the Attorney-General’s Department and DFAT provide a comprehensive rundown in their annual reports on extraditions in general during the year, and specifically on each person’s outcome: trial, conditions of detention, and health. Parliamentary Joint Committee inquiry on the ACC Amendment Act 2007: CLA’s submission highlighted the fact that a crime-fighting agency operated beyond its legal powers, and ignored legislative reporting requirements on it in a flagrant manner. These failures are a worrying trend in all such agencies in Australia, nationally and in the States. Along with many organizations, CLA criticised the jingoistic nature of the test, and suggested that – if a test was to be required at all – it be improved by including generic questions relative to modern life in Australia. The Rudd Government adopted changes along the lines CLA (and others) proposed. This submission questioned the motivation of the ACT Government in proposing changes to the court system following a discussion paper entitled Reforms to Court Jurisdiction, Committal Processes and The Election for Judge Alone Trials. CLA criticised the government’s aiming for ‘efficiency’ when ‘effectiveness’ and ‘justice’ are better determinants of a fair go in society. Several recommendations made by CLA were adopted. These changes in the ACT reflect a national malaise in justice administration, under which numerical efficiency is being allowed to swamp considerations of adequate time/integrity of process. A fair trial can be a costly undertaking, and slow. A fast trial, of more questionable fairness, may be administratively desirable, but is an anathema to justice. The fiscal-fair go dilemma will becoming increasingly a matter of debate over the next decade. Review of the ACT Road Transport (Alcohol and Drugs) Act 1977: Random drug testing is a creeping extra infringement on the civil liberties of Australians throughout the nation: where it is not yet introduced, jurisdictions are considering it. A quick, on-the-spot drugs test is so inaccurate as to be virtually useless, while a proper test with some scientific validity takes about 35-40 minutes. Combined, these issues make random drug testing highly impractical until testing methods and kits closer to the relative accuracy of alcohol testing equipment can be developed for drugs. In the absence of accurate tests in a timely fashion, random drug testing is a police public relations exercise, done more for the cameras than the courts. Senate Legal and Constitutional Affairs Committee inquiry into the Independent Reviewer of Terrorism Laws Bill: CLA’s submission highlighted the fact that the anti-terrorism laws, passed in haste after the 11 September 2001 aircraft attacks on the USA and other bombings, had done Australia a service – they pointed to the clear need for an Australian bill or charter of rights. At year’s end, the Rudd Government was proposing an ‘independent review’ mechanism, and had also launched a consultation on the need in Australia for a charter of rights and responsibilities. Submission on repeal of Euthanasia Laws Act 1997: CLA’s submission highlighted the inalienable right individuals have to decide whether and when to end their own life, and the right that all Australians have to elect representatives to their State (or equivalent, Territory) parliaments who can make democratic decisions on their behalf without ‘big brother’ interference by the national parliament, as has occured with Northern Territory and Australian Capital Territory legislation. Inquiry by House of Representatives’ Legal and Constitutional Affairs Committee: CLA highlighted the anomaly of the Public Service Commissioner, Ms Lynelle Briggs, touting at a public hearing to run any new, expanded whistleblowing program, when her approach to whistleblowing has been a contributory and considerable stumbling block to a positive program in the Australian Public Service. CLA was again alerted to a major national issue by an options paper prepared for the ACT Legislative Assembly. The ACTLA has, in the past, been a catalyst for national change some 3-10 years down the track in important social justice areas, most noticeably by being the first jurisdiction in Australia to introduce a Human Rights Act, in July 2004. CLA is closely watching the development of new mental health legal initiatives in the ACT with a view to creating a possible template for Australia. The work is in progress at year’s end. This issue resulted in a fiasco in the ACT Parliament when, at the last minute, the ACT Government was forced to back down and make amendments to its proposed sexual assault legislation – and also support amendments proposed by the Greens – because it had refused, over a period of more than 12 months, to take the advice of CLA and various barristers of the ACT Bar. 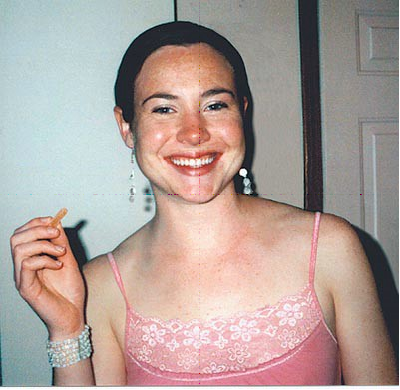 The legislation ultimately passed makes it much easier to convict alleged sexual assault perpetrators, and will almost certainly lead to wrong convictions. The way the government handled the matter shows how misguided ‘consultation’ can produce a sub-optimal outcome, to the community’s detriment, on various levels. In this case, victim groups and police ran a supposed ‘consultation’ process in which 60 of 61 groups/individuals consulted were of the one viewpoint; the odd one out could be considered in the middle on the issue. The Attorney-General refused over a period of 18 months to include a female barrister member of CLA on an advisory committee preparing the legislation. The result was a midnight legislation farce in the parliament, and new laws that as biased in one direction as victim groups believe the earlier version were biased in the other direction. CLA undertook the first stages of a project to secure funding for all civil liberties and human rights bodies by the Australian Government from a pool of existing funds which is regularly topped up ‘automatically’. We are asking the Minister for Home Affairs, Bob Debus, to add one line to Proceeds of Crime legislation that would make CL and HR bodies clearly eligible to apply annually for funding from this ‘inexhaustible’ source. The project continues in 2009. CLA also made official comment to the Australian and New Zealand Policing Advisory Agency on a draft version of Directions in Australia New Zealand Policing 2008-2011. Main authors for submissions and follow-up work in 2008 were Director Anthony Williamson, Director/Webmaster Lance Williamson, young lawyer Juliette Duong, law student Jennifer Thompson, CEO/Secretary Bill Rowlings and President Dr Kristine Klugman; various other CLA members also provided advice and counsel during preparation of various submissions and papers. We would welcome more volunteers to help with submissions – if an issue interests you, please let the CEO/Secretary know; also, notifying the Secretary early of opportunities to make a submission can be very helpful, when you see an article or an advertisement in your local newspaper, online or in the national media. In last year’s annual report, CLA called for “a total review of the excessive over-reaction in Australia to security threats – in legislation, by police, secretly by ASIO and oppressively by the federal government – … in 2008”. Unfortunately, this did not happen during 2008, though there were indications that at least some of those issues might be addressed in 2009 under an ‘independent review of terrorism laws’ process, generated by the efforts of Petro Georgiou MHR and Senators Judith Troeth and Gary Humphries (pictured). We hope so. Throughout 2008, CLA representatives met with a very wide range of parliamentarians, particularly those on influential committees involving legal, constitutional and human rights matters, to put CLA’s viewpoint on the upcoming charter of rights and responsibilities consultation. CLA is concerned that the outcome of consultation will be line ball in terms of public support for a charter, and that doing nothing will become the preferred option of government. CLA has been proposing a fallback position of holding a Legal and Constitutional Affairs Committee inquiry into what Australians consider their civil liberties are and should be, with the aim of producing a foundation or benchmark document that spells them out, which can be formally endorsed by a parliamentary vote at least, or preferably by being entrenched in legislation. One other ongoing project, while not a formal submission, is to ensure that the people of the Northern Territory and the Australian Capital Territory do not continue to be second-class Australians when it comes to democratic rights. Today, the federal parliament by vote OR the Governor-General (that is, the executive federal government meeting in secret) can over-rule democratically enacted laws of the territory parliaments. Equivalent laws passed by State Parliaments cannot be so over-ruled. This is a major anomaly of the Australian democracy, which must be remedied. CLA worked last year on a cross-party Bill to be put to parliament to eliminate the G-Gs ability to effectively veto an Australian parliament’s vote. We originally had cross-party support, but there appears to now be a lack of resolve by ACT Members of Parliament. We will be trying for stiffer spines in 2009. CLA analysed the reports of departments of prime interest to liberties and rights in Australia, such as the Australian Federal Police, ACT Policing, ASIO and the Ombudsman, as well as dipping into the key sections, such as human resources branch reporting, of other departments’ reports. Director and Webmaster Lance Williamson gives a strong lead on police matters, and he continued CLA’s series of analyses of the ACT Policing annual report. As in previous years, this analysis will be used as the basis for background briefing of local and federal politicians and media. The success in regard to police being bound by human rights law was a direct result of analysing police annual reports, and show how much impact such seemingly mundane activity can have. There is an opportunity for members to analyse a State/Territory or Commonwealth annual report each year, and produce a 1-2 page précis of key issues of concern. As noted immediately above, a clear statement of a deficiency, allied to year-after-year of follow up, can produce eventual outcomes of significant value in terms of the human rights of little people. Please email the Secretary if you would like to work on analysing an annual report, and nominate which one you would like to cover. CLA also analysed numerous other non-annual reports during 2008, such as those relating to the Dr Haneef affair, with a view to ensuring that all players stick to their commitments in the future. The question of following up on commitments – in reports, to courts, in recommendations made by coroners, in statements made in parliament or to the media by Ministers and agency CEOs – is one which CLA will devote additional time and effort to in 2009 and 2010. Sometimes, for example, even the strongest of coroner’s recommendations are simply ignored by the bodies meant to implement the improved actions or processes. Australia needs a system of recording, monitoring and reporting on progress (or otherwise) in this important area of potential improvement to civil society. CLA helped individuals in a small number of selected cases during 2008. Mostly, we decide to help where the case can correct or highlight generic issues, which will ultimately benefit many more people across the nation. There are also cases where people have gone beyond available community help, or have fallen through cracks in the system. before they would give him a normal pension to which he was entitled. As is not unusual, Centrelink had provided him with incomplete information as to the laws governing his situation when he asked for an explanation of why they thought they possessed powers to pry into his private life to such an extent. (Centrelink is one of a number of departments and agencies which appear to be not well acquainted with the Australian Government’s model litigant principles, which have the force of law and could have significant ramifications for agency CEOs, who are personally responsible for the operation of the the principles). High profile court cases normally get most public notice, but the sweeping powers of agencies like Centrelink are the ‘hidden’ abusers of rights of ‘little people’, who are powerless to fight against bureaucratic power either gone mad, or being abused. (See Model Litigant project 2009-2010). CLA was also able to help resolve, with the help and understanding of the Inspector General of Intelligence and Security, Ian Carnell, and in cooperation with the Australian Federation of Islamic Councils president, Ikebal Patel (a CLA member), a difficult case involving personal health issues. We took the first steps in achieving more widespread involvement of members throughout Australia in 2008. The breadth and quality of members is one of CLA’s greatest assets. In 2009, it is hoped we can expand on the tentative steps taken this year. Member Mrs Phylli Ives (pictured) took on the role of ‘general inquiry’ coordinator. Through the CLA website, we receive one or a number of emails a day asking for advice on liberties/rights/legal matters, explanations of CLA policy, media interview requests, and assistance with school and university projects. The majority of these inquiries are, in fact, pleas for help from people sometimes at their wits’ end. Mrs Ives coordinates volunteer CLA members who, in rotation or by using their appropriate special knowledge, answer these queries. In 95% of cases, no legal knowledge is needed – so please add your name to the volunteers if you would like to help: an inquiry can take as little as 10 minutes to answer, or can lead eventually (with help from other members) to major changes to national or local laws or policies. We hope to take the above template and use it in other aspects of what CLA does, or needs to do, in 2009 and beyond. Mrs Ives work in managing this project, and being the hub of the network, has been outstanding. From CLA’s perspective, the aim is to build interest in civil liberties and rights issues in rural and regional Australia using the vehicle of the fight against mandatory internet filtering. It is also a test of how quickly, and well or otherwise, CLA can put a campaign in place and be effective. Even in the first month (December 08), many lessons have been learned of use for future decisions about taking on campaigns. Parliament House protest project: Led by President Dr Kristine Klugman, this project aims to wind back the over-the-top security activities of the AFP and its Australian Protective Service officers, as noted in the 2007 annual report. Australia may be the only country in the world where you can get a police record for life for protesting quietly and legally in an area specially set aside by the national parliament for you to protest. There was a setback when the Speaker of the House of Representatives, and the President of the Senate, wrote to CLA saying they refused to instruct the police how to behave in the designated protest area. This failure of the presiding officers of the parliament is the more egregious when it is realized that the police run security at Parliament House under contract to the parliament, not under their customary national policing responsibilities. The AFP guards the parliament like a prison, rather than the people’s parliament. We continue to work on making the parliament’s presiding officers and the AFP/APS see the light. Many individual parliamentarians support CLA’s stance, and we will continue to build momentum by individual briefings until the situation is corrected. In most democracies, police do not tell parliamentarians how things will work: the reverse is the case. Radio project: The project to create a monthly radio program for airing on community and campus radio was not achieved in 2008 due to other commitments. 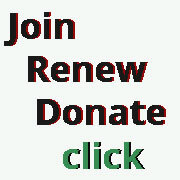 It remains an aim, but needs help from member volunteers before it can be achieved. One member, Steven Zanuttini of Sydney, has written theme music specially for the program, which is a great start. Please nominate to help if you are interested in this area. Prisons: A sub-committee of Diana Simmons (NSW) and Keith McEwan (Victoria) are monitoring and collecting information on prisons throughout Australia. We anticipate that prison issues will come to the fore in the next few years, as the infamous State crackdowns on ‘law and order issues’ during election campaigns produces over-crowded prisons full of people with mental health issues. This is a sleeping problem which could easily explode. There is also reason to believe that a number of Australian prisons will be called to account when the Australian Government endorses the Convention against Torture, which will permit full and open international inspection. ‘Supermax’ prisons are unlikely to pass muster: putting remand prisoners in ‘supermax’ conditions for 1-2 years while awaiting trial most certainly will not. Police: Director Lance Williamson leads the project to actively monitor police forces throughout Australia and to keep a watchful eye on new technology, such as use (and possible abuse) of stun guns, CCTV and both ordinary and extraordinary police powers. During 2008, President Dr Kristine Klugman and Director Lance Williamson met with Sue Wilkinson, executive director of the Australian and New Zealand Policing Advisory Agency, to try to pursue issues on a national level, so that CLA’s work in one jurisdiction can be leveraged across a number. For example, CLA supplied Ms Wilkinson with a copy of the Clea Code (see later). Internal systems: Former board member Liz Shaw helped reorganise the organisation’s filing, history and letter registration systems, which was an enormous help towards ensuring that we can handle matters efficiently. As CLA matures, the organisation is changing shape and it requires new administrative rules and methods which Ms Shaw was instrumental in helping to set up. More, similar help would be appreciated. Community legal practice: During 2008, the board (through Anthony Williamson) began to investigate the option of registering CLA as a Community Legal Practice (CLP) to be able to handle a pro bono case, if an appropriate issue arises. The board discussed the matter on several occasions, and is still considering whether to partner with a registered practitioner in terms of law society registration and the question of legal practice insurance. The board has indicated that only cases involving broad, generic questions of principle would be taken on if we adopt a CLP role. CLA has also raised the issue of creating a new system of allowing ‘retired’ legal people to appear in pro bono cases, under a simpler legal registration and insurance scheme. The question was raised two years ago in the ACT, but we expect to be proposing a national scheme to A-G McClelland in 2009. CLA continues its extensive networking approach to influencing thoughts, actions and decisions. Details of these meetings have been reported in the monthly CLArion newsletter (http://www.cla.asn.au/page/clarion.php). The process, after about three intensive years, is starting to bear fruit: CLA is now widely known in parliamentary and liberties/rights circles, and has a reputation for achievement: “You (CLA) are punching above your weight,” is how Special Minister for State, Senator John Faulkner, phrased it when commenting to CLA President Dr Klugman during a meeting on Freedom of Information, whistleblowing and charter of rights issues. Model Litigant Obligations: One activity begun in 2008 which is expected to last through 2009 and 2010 is the Model Litigant Project. CLA is partnering with the Law Council of Australia, the Australian Lawyers’ Alliance and the Institute of Public Administration Australia to put pressure on the Australian Government to do more than pay lip service to the Model Litigant Rules. The Office of Legal Services Coordination (OLSC) in the Attorney-General’s Department is responsible for administering the Legal Service Directions 2005 (LSD), which is a legislative instrument binding most government departments and agencies, and dating back to 1903 legislation – it is not a new concept. Basically, under the Model Litigant Obligation section of the LSD, the government has to behave properly when it is involved in legal dealings with citizens. It is not meant to bully or to forcefully use its size and financial clout, or to act in a overly-aggressive legal manner. It is meant, for example, to make all relevant documents available to a court even if producing some of them could benefit a claimant against the Commonwealth of Australia. Most people dealing with the government on legal matters agree that the Directions and Obligations, as they relate to the government acting as a ‘model litigant’ have not been followed as closely as they should be in recent years, probably since the advent of a new system of panel legal firms working under contract to government departments and agencies, which began about 10 years ago. CLA identified the matter as an issue of public importance when a number of individuals came to us with stories of being ‘screwed’ by the government in legal matters. When we investigated, we realised there was a problem beyond the individual cases. We consulted with the organisations mentioned above, who all agreed that the Model Litigant issue needed to be re-addressed by the Attorney-General, his department and the OLSC, and individual government departments and agencies, and their lawyers. CLA CEO Bill Rowlings wrote an article in the November 2008 Public Sector Informant, a monthly newspaper circulating widely in the federal public service. This article has generated a great deal of interest, and many more example of inappropriate behaviour by government departments and agencies have come to light. In 2009 and 2010, CLA will be working with the three partner organisations towards restoring the integrity within government of abiding by Model Litigant Obligations. We will do this by a formal approach to the A-G, by monitoring the work of the OLSC, by scrutinising tenders for panel legal contracts, and by raising the issue to keynote level at major legal and administrative conferences. Clea Code: A mainline activity in 2008 was the Clea Rose initiative. In this special program, CLA worked with the family of Clea Rose (pictured), a 21-year-old university student killed by a car driven by a 13-year-old driver during a police chase in Canberra’s city-central pedestrian/bus/taxi mall in July 2005. CLA and the family developed the ‘Clea Code’, a new set of guidelines for police to decide whether to involve themselves in a car chase and whether to continue a chase once started. CLA is continuing to promote the Clea Code as a national code: we will be working through police peak groups to have it adopted. The Clea Code draws heavily on the Victorian Police car chase code, which is an excellent starting point for eliminating senseless and dangerous police car chases by gung-ho, adrenalin-warped, young police officers who do not have sufficient maturity or training to make appropriate judgments. CLA believes that, as well as a better code, police should have initial special car chase driver training, then follow-up training every two years, and should not be permitted to be involved in a car chase unless their car chase driving certification is current. There was an election for the ACT Parliament in November 2008, which CLA used as trial run for the next major election. We wrote to all ACT candidates (only about 80 in such a small jurisdiction) with an information package that introduced civil liberties and asked the candidate to commit to them during the next parliament. Rather than a traditional questionnaire, which has seen its use-by date pass, the CLA approach is to educate and leave open the opportunity for two-way communication in future, whether the candidate is successful or not. manage other volunteers who can deliver them. It is possible to manage the program from anywhere in Australia, but a Goulburn or Canberra-based person with teaching experience could be ideal. CLA had a stall at the ANU’s Market (Orientation) Day in February, and signed up about a dozen new student members. As well, the stall was useful for visibility reasons with many academics and politicians who also attend the day, and for making contacts with other civil liberties, human rights and similar groups. Photo shows Treasurer Kevin Popple, ANU Law student Cynthia Ganesharajah and President Dr Kristine Klugman on the stand. The principal outreach activity involved placing CLA’s cartoon exhibition, Laughing With Knives, in the Goulburn Municipal Library in NSW for two weeks. Goulburn CLA convenor Fred Rainger was responsible for organising and coordinating this excellent placement. Outreach activities occurred with many groups, including the Australian Republican Movement, Red Cross and Amnesty, as well as at public forums on accountability, a forum to mark 60 years since the UN Declaration of Human Rights, an Intergenerational Forum involving Prof Sol Encel of the University of NSW, and the Centre for International and Public Law’s International Conference at ANU, as well as a seminar at the National Museum of Australia on Public Law and Public Leaders. CEO Bill Rowlings gave the keynote address to the 41st anniversary dinner of ANU’s John XXIII College, on liberties and rights in 40 years time and how today’s university students would be the shapers of the society of that time. CLA again took part in the annual Department of Foreign Affairs and Trade consultation with and briefing of non-government organisations (NGOs). University of Canberra law student Rosheehan O’Meagher represented CLA and followed up on a number of initiatives, including the fate of an Afghani student under death sentence for standing up for women’s human rights. We briefed the Human Rights Branch of the Commonwealth A-G’s Department on the background and current status of civil liberties organisations in Australia, and the activities and initiatives of CLA. We undertook the briefing so that CLA could be included in the next round of A-G’s briefings. Member Diana Simmons attended the NGOs’ Human Rights Roundtable on a Charter of Rights held at the University of NSW. We also liaised with Barry Dickson of the Tasmanian Council for Civil Liberties on the same issue. Two members – former Chief Justice Jeff Miles and University of Canberra Law student Rosheehan O’Meagher – attended the Federal Criminal Justice Forum of the Minister for Home Affairs, Mr Debus, at Old Parliament House on behalf of CLA. An Annual General Meeting was held on Saturday 5 April 2008 at the National Europe Centre, Australian National University, Canberra, with 41 people present. CLA President, Dr Kristine Klugman, announced that she planned to concentrate on raising funds in 2008 and, with a foundation amount in hand, stand down as president in 2009 to concentrate on full-time fundraising with a view to employing a full-time executive officer. However, 2008 proved a less-than-ideal year in which to launch a major fundraising initiative. For the moment, the initiative is on-hold. After the AGM, Professor George Williams, a CLA member and the chair of the Victorian consultative process which produced that State’s Charter of Rights and Responsibilities, gave an excellent address on the background of attempts to create a national bill of rights for Australia. He urged people to put pressure on the Attorney-General, Mr McClelland, to hold the promised national consultation. If you missed the AGM, you can hear Prof Williams’ talk here At year-end, the work of Prof Williams, CLA members and many other civil liberties and human rights supporters paid off when the A-G announced a national consultation from 10 December to mid-2009. In 2009, CLA will hold its first electronic AGM (eAGM), as approved by the 2007 AGM. At year-end, Webmaster/Director Lance Williamson and CEO/Secretary Bill Rowlings were finalising the methodology and timing for this innovative approach, which we believe is a first for Australia in the form it will be held. The final form of the eAGM follows proposals made in a major report to the board of options by Mr Williamson to the August board meeting: his work is at the cutting edge of organisational democracy in the new e-environment. The full board met four times in 2008: February, May, August and November. The board has operated well as the philosophical leader of the organisation, focusing on longer-term policy and national matters where CLA can anticipate the need for change and improvement and take an issue-leading position. Two new members joined the board during the year, appointed by the President: Anne Cahill Lambert in April and Jessica Mohr in May. Ms Cahill Lambert added extensive management and board experience from other organisations, and an innate ability to generate ideas, to the board, while Ms Mohr brought a fresh new approach, legal qualifications and up-to-date knowledge of the federal Public Service. PS issues comprise a significant part of CLA’s workload – Freedom Of Information, whistleblowing, people’s access, lack of agency responsiveness on issues such as Model Litigant obligations, matters related to the Public Service Commission, etc. Ms Mohr took on the role of Agenda/Minutes Secretary to great effect. Their appointments followed the resignations of Ms Amanda Alford and Mr Vic Adams due to pressure of other commitments. 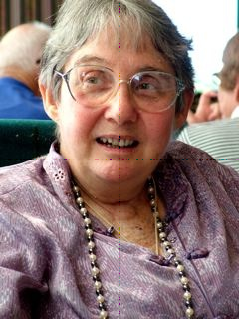 Ms Alford had helped significantly to advance CLA’s student activities, mainly at the ANU, during her time on the board, while Mr Adams had managed death penalty issue and associated interstate liaison to the great benefit of the organisation. The financial report below indicates CLA had a successful year, with a surplus of $2243 and total funds going into the 2009 year of $6915. Treasurer Kevin Popple continued to refine the organisation’s membership records, invoicing and accounting systems, making them robust and capable of being easily passed to someone else’s stewardship for a short period, or permanently. At year-end, he was starting the process of securing a longer-term replacement. However, we hope he continues to offer his services as a board member, and in a back-up treasurer role. be capable of maintenance on-line by the webmaster or others. The site is discoverable through major search engines and blog aggregators, making its content more widely available. To assist overseas visitors, the site now contains a language translator for all articles. CLA members and the public can also access automated advice of web site content update via the Desktop Alerts feature or share content with a friend via Share This Article. During the overseas absence of Webmaster Lance Williamson in October, member Francis Markham managed the web site. He also assisted in the ongoing development of ground-breaking e-voting requirements for the 2009 eAGM. His assistance has been greatly appreciated. Civil Liberties Australia’s web site is built almost entirely from open source software – software generally developed in a public, collaborative manner which the public can use, modify and redistribute in a modified/unmodified form for free. In the course of developing CLA’s e-voting system, Mr Markham created script that has now become part of open source code available worldwide. Also, Civil Liberties Australia joined the growing community campaigning against the Federal Government’s planned introduction of internet censorship. 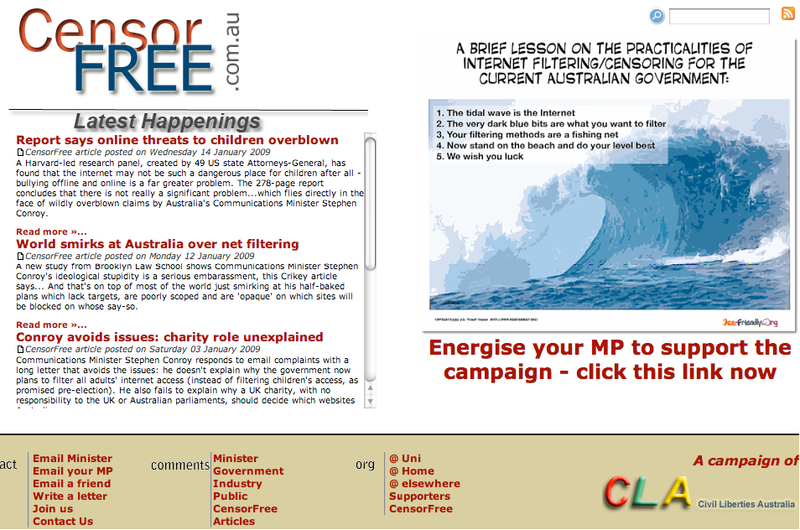 In December 2008 the CensorFree (http://www.censorfree.com.au ) web site was launched to support the campaign. CLA was extremely fortunate to be able to have a new, eye-catching and easy-to-navigate site designed and built in a very short time frame: we are indeed fortunate in the quality of the people working on CLA issues, no more so than in the web area under the leadership of the Webmaster. Financial memberships at 31 December 2008 totalled 224. This is an increase of 55 over the year, or a rise of more than 30%; about 13% of members are students, mostly from universities. As noted previously, CLA is keen on building quality membership of people who are prepared to contribute their knowledge or experience – and occasionally a little time – rather than necessarily simply boosting numbers. We continue to seek new members from rural and regional Australia particularly, and from areas where there is an urgent need for the voice of civil liberties to be heard. Where there are sufficient numbers, we will consider forming a branch/group that can develop its own local programs in conjunction with the national initiatives. The website continues to attract new members from throughout Australia, so the challenge is becoming to find a way to involve people more electronically. We started to do this in 2008 with a roster of members volunteering to answer general inquiries to the website; we hope to build on this initiative in 2009. Volunteers who read letters to the editor in the major metropolitan newspapers, and in daily regional newspapers, are required to help with an initiative to extend our targeted outreach program. As noted last year, the extra work would be a matter of minutes, maybe 60 a week in total. We continue to mentor university student members, and particularly to help them with internship and honours opportunities, and CLA members continue to make valuable contributions to society in a wide variety of ways. For example, CLA members Ernst Willheim and Professor Kim Rubinstein of ANU applied to be heard as amici curiae – friends of the court – in the High Court challenge to the federal government’s NT emergency intervention legislation. They submitted – unsuccessfully – that the court should have regard to a range of international law and human rights principles in deciding the case. In WA, there is a pleasing growth in the diversity of people involved, but we have been unable to as yet secure the right person to act as convenor (like a branch president) or secretary (information hub) of the group, following Peter Dowding having health and bar practice relocation issues over the past period. The quality of members in WA is excellent, and individually some are achieving significant breakthroughs. For example, Murdoch University Communications program leader Johan Lidberg worked during the year on media shield laws with other academics and the Media, Entertainment and Arts Alliance, as well as being primary developer of a new tool to measure FOI compliance and to compare FOI across nations throughout the world. Mr Dowding and other lawyers continue to work on analysing the effectiveness or otherwise – as well as the excesses or otherwise – of WA’s Corruption and Crime Commission. Another new member, James Fairbairn, regularly issues his own rundown of civil/liberties/human rights articles from major world news outlets, and has just begun his own rights/responsibilities program on community radio. Long-time local civil libertarian, Brian Tennant, is a regular letter writer and a great source of clippings and information alerting the national office. In WA, the challenge in 2009 will be to better coordinate the diverse activities under way in that State, and to seamlessly link WA initiatives and national initiatives, in a two-way process. The Goulburn CLA branch continues to struggle, having lost the focus of detention in Guantanamo Bay of David Hicks, which caused its formation. Nevertheless, Goulburn hosted the CLA cartoon exhibition in 2008. The city of 27,000 is ideally placed to monitor the NSW Police Training Academy and one of NSW’s major ‘supermax’ prisons, both located there, but until now it has been thought that those facilities were too close to home for a local group to be involved. It may be worth re-thinking that approach, as locals members could contribute to a national prison project, for example, or on particular human rights or police chase educational initiatives, as a number are former senior teachers/managers. BBQs were held at the home of the president and secretary on a number of occasions, giving new members and student members particularly a chance to meet and mix. The challenge for 2009 is to find an electronic version of the BBQ! On all occasions – public meetings, barbecues – CLA tries to ensure a mix of age groups and, particularly, to enable university students to mix with people experienced in the law, and in life. Afterwards, students are always extremely complimentary of the opportunities to meet and mix with such people…as are the seniors. As CLA matures, administrative issues are becoming more important, as noted above. The excellent contribution of several board members, particularly Treasurer Kevin Popple and Director/Webmaster Lance Williamson, has contributed greatly to the ongoing growth and success of an organisation ‘punching above its weight’. 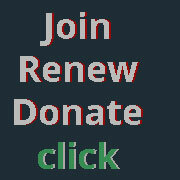 Funding: President Dr Kristine Klugman foreshadowed a major fundraising project at the 2007 AGM. This has been put on hold, but will be resumed when financial conditions appear more suitable. Meanwhile, we are moving to free up access to funds from federal government sources (proceeds of crime) in a way suitable to CLA and other civil liberties and human rights groups. Currently, there is plenty of money available for large CCTV installations…but no money available, under the program’s rules, for a group like CLA to undertake a robust, academic-style research project as to whether CCTV is worth the money being spent on it. That is an anomaly which needs correcting. With philanthrophy not a major source of funds in Australia, at best, CLA is looking to possible overseas sources of such income. However, we would prefer one or more wealthy Australian businessman or business, motivated by civil liberties and human rights concerns, to help fund a secretariat for the organisation, which is the likely next major step in terms of growth. A full-time secretariat may be 5-10 years away at the moment, but small steps towards that end are possible, either by funding a person’s employment one day a week to start and/or by providing premises and other assistance. (If you know of anyone who might be approachable along these lines, please contact the President, Kristine Klugman. Also contact her if you are considering nominating a donation to CLA in your will – we can assist with a simple form of words). We have identified a sum of about $US2 million (about $3m Australian) as a target figure. This sum, along with membership income, would provide a sufficient annual investment income to fund a chief executive officer, an offsider/research person, and their office needs. CLA’s aim is to attract quality and commitment from the university and other student community, rather than quantity. 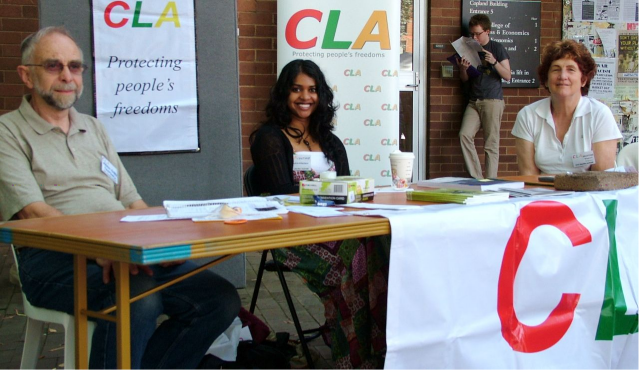 CLA took a stall at Market Day at the ANU in February and signed up a number of members; a separate barbecue for students was also held, attended also by CLA’s former media spokesperson, Max Jeganathan, who is also a former ANU Students Union president. ANU student Karlie Brown undertook research into the current situation in relation to DNA legislation, particularly at mandatory (or ‘voluntary’, as in Defence terms) provision of DNA samples by AFP officers and Defence Force personnel, as well as Guthrie cards for newborn babies and the potential for difficulties if DNA samples and test results become available to the superannuation and insurance industries. Her excellent paper is available on the CLA website: see DNA: US legislates, why not Australia? for the situation in the USA, and for Ms Brown’s paper. Our relationship with the ANU College of Law, through CLA member Peter Ford and a number of other members, is valuable in producing quality papers for CLA, a semester-equivalent course credit for the student, and a contribution to the future thinking of Australian society. We are keen to introduce similar arrangements with other Australian universities. A pilot program with the University of Canberra began in 2008, but different structures have made completing the project difficult in the early phases. We are also in continuing discussion with Murdoch University in WA on a similar program. At year-end, ANU Law student Shane Svoboda was undertaking an internship through the ANU program which involved analysing whether constitutionally protected civil liberties in Fiji and post-independence Timor Leste, which are enshrined in law, are being actively enforced in practice, and what future changes of attitude or processes might be proposed to improve the situations in the two countries, and how CLA might assist. He was being supervised by CLA member, barrister and Army Reserve officer, Dr Bernadette Boss. who has first-hand experience in Timor Leste. CLA continues to provide its monthly newsletter to the executive of other civil liberties bodies in Australia. That is reciprocated by NSW, with its quarterly journal, and Queensland, with its periodic journal. 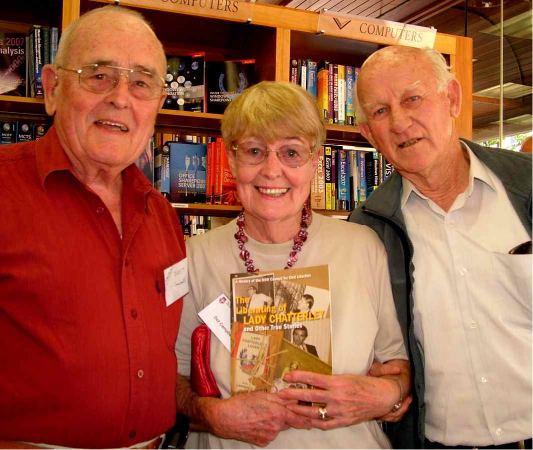 In 2008, we assisted with the ACT launch of the NSW Council for Civil Liberties’ history, The Liberating of Lady Chatterley, at Daltons Bookstore, Canberra. CLA President Dr Kristine Klugman spoke, CLA Director James Staples officially launched the book, and many CLA members attended the event and bought copies. Photo shows the authors, Scott and Dot Campbell and CLA’s James Staples (right). We are also assisting with promotion of the book Buckleys, the autobiography of one of the three founders of the NSWCCL and its longest-serving board member, Ken Buckley. initiatives beyond the national charter of rights consultation. The CLA board remains keen to form partnerships and networks with other civil liberties bodies in Australia, in the Pacific region, and worldwide. CLA’s media spokesperson role has been subject to unavoidable volatility during 2008, due to changed employment circumstances. Dean Prail became the nominated spokesperson early in 2008, when he was managing a smaller private sector law firm in Canberra. Just as he was developing an excellent rapport with the media, and building contacts, he switched to employment with a federal government agency, which meant that for some months he was unable to stay committed to the role. When he resumed, he was unable to comment on issues that might be related to his employment area. We look forward to his resuming the primary spokesperson role in 2009. In December 2008, David Mathews became CLA spokesperson on the mandatory internet filtering issue, with a view to backing up the main spokesperson role and being able to take over if Mr Prail’s work circumstances prevent his continuing. Mr Mathews’ business is in computer technology and he has experience of public speaking, having stood for a parliamentary seat in a recent election campaign. The CEO/Secretary Bill Rowlings and President Dr Kristine Klugman can act as back-up spokespeople, or when the issue or circumstances dictate a board level response, and Director Lance Williamson, with his special expertise, can handle interviews and briefings on police and associated matters. 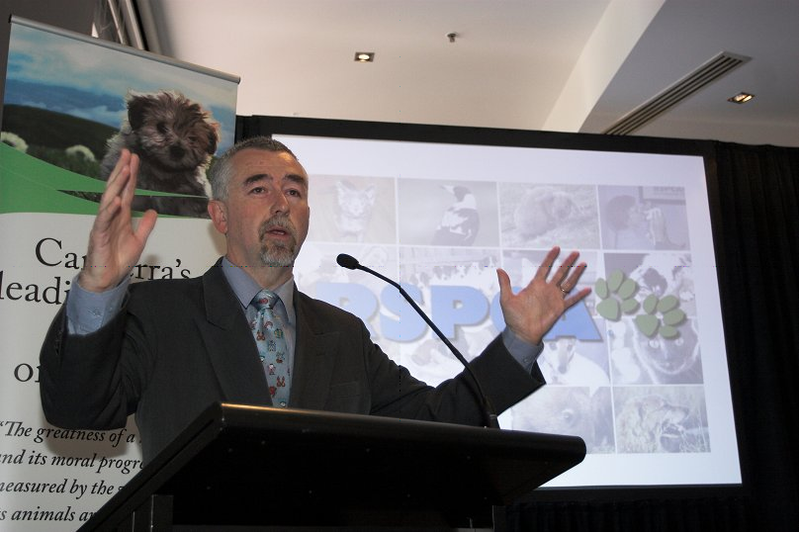 Mr Prail undertook interviews for national media outlets across radio, television and print, particularly from Sydney and Canberra-based media outlets. Mr Rowlings undertook interviews with mostly radio and print media in Tasmania, Victoria, Queensland, South Australia and Western Australia, as well as for print outlets such as the Indigenous newspaper, the Koori Times. CLA contributed articles for Public Sector Informant, as noted earlier, and for the Australian Muslim magazine. There was a noticeable increase in approaches from ABC rural and regional radio stations during 2008, and from tertiary media training outlets. For the first time, CLA produced a 15-second community service announcement (CSA) TV advertisement in late 2008, courtesy of Blumers Lawyers who funded production costs. The theme ties civil liberties in Australia in the 21st century to miners fighting for their rights at the Eureka Stockade, and the ad ends with a call to join or contribute to CLA. You may see it on very late night TV, on a commercial station. We do not have to pay advertising rates for a CSA…but whether or not it runs is at the whim of TV stations. If you do see it, please let the Secretary know. Many CLA members have contributed greatly to the letter pages of Australia’s major daily newspapers. Of particular note is the effort of Keith McEwan of Victoria, who is indefatigable in his support for Indigenous policy and prison reform, and who writes regularly to The Age, The Australian and The Canberra Times. a fundamental re-assessment of how Australia declares war (or becomes engaged in military conflicts) and the development of a process for the Parliament to regain supremacy as the body in Australia which receives comprehensive defence reports on a regular basis and makes national decisions when time permits. The Rudd Government refused to act on any one of the proposals. However, they are now reinforced as national agenda items, and CLA continues to promote them to parliamentarians and others in regular and ad hoc meetings. The relevant letters and the responses are on the CLA website. CLArion: The monthly newsletter CLArion came out on or just before the first of each month, and was distributed electronically to members, supporters and others working in the civil liberties and human rights field. As our primary form of regular communication the CLArion is a very useful tool for members to interest other people in the organisation and its activities: print off a copy, and give it to a friend, or send a colleague an electronic version. CLArions are produced in two versions: a email text version, which goes to most members, and a PDF version in two-column format, which is printed and distributed to members who do not have email, and distributed at meetings with parliamentarians and other individuals and organisations. A member donated three new banners during 2008, for which we are very grateful. One is the type of banner that could lead a march, while the other two are lectern banners, of smaller size. An organisation concerned with civil liberties (Council for Civil Liberties of the ACT Inc) existed in the ACT in the 1970s, 80s and 90s. Mostly, it was organised and managed by Mr Laurie O’Sullivan, a barrister at the Sydney and Canberra bars who also had extensive involvement with the Australian Public Service Board over many years. In the late 1990s, the organisation’s management changed and Mr Jon Stanhope became prominent as president. He went on to a political career, and to be Chief Minister of the ACT at the time of this report. After Mr Stanhope went into politics, the organisation died and then was formally de-registered by the ACT Registrar-General in the early 2000s period. A new organisation with a different name to distinguish it from the earlier body – Civil Liberties Australia (ACT) Inc. – was created when a properly constituted meeting of the interim board resolved to apply for registration under the Associations Incorporation Act 1991 of the ACT. The Certificate of Incorporation was stamped by the ACT Registrar-General on 10 December 2003. Dr Kristine Klugman OAM was the inaugural President. At the 2004 AGM, Mr O’Sullivan was voted the first honorary life member and patron of CLA. He died in October 2004. Mr John Marsden, a former president of the NSW Council for Civil Liberties and of the NSW Law Society, later became patron. He died in May 2006. 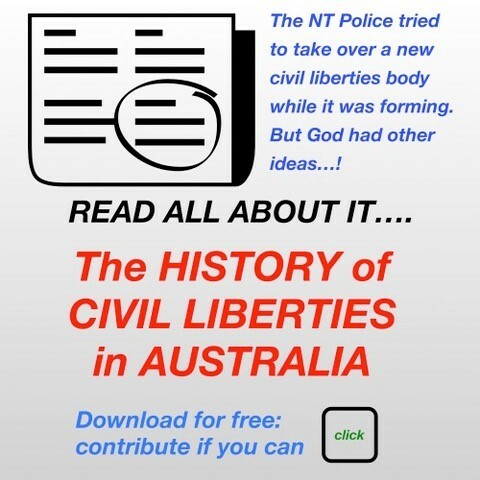 In March 2007, the AGM agreed to change the organisation’s name to Civil Liberties Australia Inc. (dropping ‘ACT’ from the name) to reflect the reality that the organisation was having an impact and drawing a response in other States and the Northern Territory of Australia. The AGM also agreed that voting on important issues like board positions and constitutional change could be handled electronically. CLA was therefore one of the first organisations to come to grips with the electronic age for membership/voting. In 2009, there will be an electronic Annual General Meeting (eAGM) for the first time.